I’m warning you, the below may ruin your day. Around two years ago I was fortunate enough to meet David and Trisha Creekmore. Trisha and David were players of Warhammer Online, exemplifying the phrase “the couple who plays together stays together” in every possible way. They not only played video games together, they celebrated life together, travelling the world with their daughters, sharing new experiences that every family should, but all as quickly as possible. You see, Trisha has cancer. Actually she was usually screaming “EFF YOU CANCER” while getting on a plane to some far off place like an African Safari or southeast Asia or god only knows where. This is what impressed me the most about Trisha. She’s never shown that she felt bad for herself and she never tolerated anyone feeling bad for her (quite the contrary; she doesn’t want anyone to pity her, something I still respect to this day). She grasps life by the short hairs and told it to hold on for dear life because this was going to be one hell of a ride. We’re talking about a woman who was so loved by the Warhammer Community (and any other game she played) that they raliied, in game, by the hundreds when she was suffering through chemo to show their support. As the Community Manager, I received dozens of messages about this Community event and how so many people were rallying around “Tinkerhell” as Trisha was known in the Community. 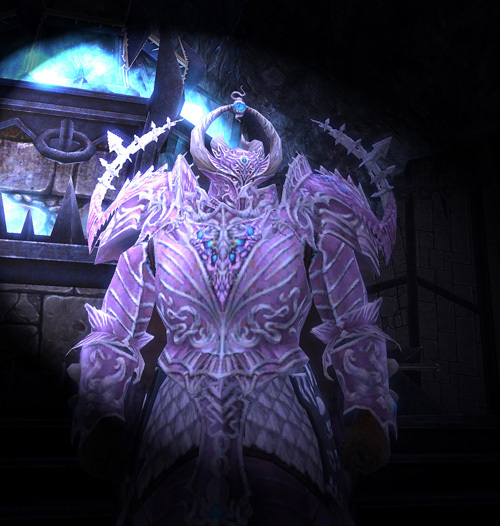 We were so inspired by this epic level of Community supporting Community that we added a special dye into the game (much to the chagrin of Games Workshop, but hey, it was an official Citadel color, and for an amazing cause so…NYAH) along with some special “Tink” themed NPCs to sell them. 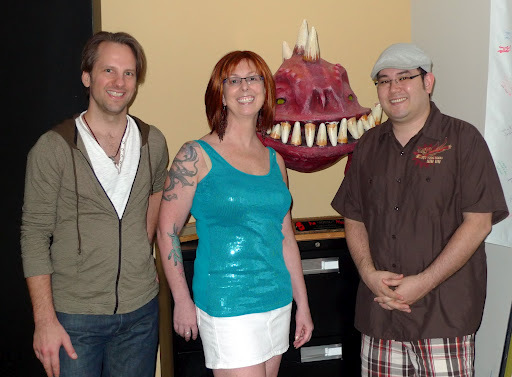 A few weeks following all of this, Trisha and David came by the Mythic studio as part of her Year of Surprises. Trisha and David both seemed immediately comfortable and at home at the studio. Not once did discussion of cancer or chemo or any of the RL stuff she was going through come up. Nope…we talked about gaming, about their family, about their travels and about other general nerdish stuff. We laughed, we did a tour of the studio, we grabbed lunch and then we came back to the studio to bid the Creekmores adieu. But not before Carrie Gouskos, the producer of WAR, and I got to sign the most epic autographs ever. Like many in the Community, I’ve kept in touch with Trisha on Facebook and followed their exploits on David’s blog; It’s a Creekmore World. I watched along in amazement as they’ve fought this terrible disease and celebrated life every step of the way. Through it all, Trisha has never lost her sense of humor nor her amazing ability to spit in the eye of cancer. Also, there’s some pretty amazing pictures of David in a tutu while on African safari. Yes, you read that right. It’s been up and down. Trisha has been in and out of the hospital at various points throughout the last few years, but she’s always rallied and went on to her next amazing adventure. This morning I read that Trisha entered hospice care. I won’t lie. This hit like a ton of bricks. I’m not close friends by any definition of the word to the Creekmores, but I’ve always felt a connection and relation to their escapes through the common string of us all being gamers. Thanks to Facebook, I’ve been able to vicariously live their adventures and to occasionally chat with Trisha in the comments of her posts or photos. I feel the bond that we all feel with each other as humans, gamers, parents, husbands and wives; one of shared experiences. You rock Tinkerhell. You inspire me Tinkerhell. If you’re on Twitter, do me a favor. Tweet something awesome and supportive (but not pitying) to @creekmoreworld with the hashtag #pinkfortink. Show Trisha the love that we all did 2 years ago. To David, Trisha and the rest of your family; Thank you for sharing your adventures with all of us. It’s been amazing to read along and to share a warm smile with everyone who frequents your blog. Our society is going to Hell in an Internet fueled handbasket…and I’m to blame. Thanks Andy,you have captured everything about Trish just through a brief encounter and lots of online stories. That’s what makes you a good community manager. The visit to Mythic and the in-game support were a huge source of joy to her. The way the developers and community cared was something really special. Sorry about your latest ups and downs – you’ll always be a great community manager.